The dramatic decline in the share of wages in GDP in both the developed and developing world during the neoliberal era of the post-1980s has accompanied lower growth rates at the global level as well as in many countries. Mainstream economics continue to guide policy towards further wage moderation along with austerity as one of the major responses to the Great Recession. In our recent report for the International Labour Office (Onaran and Galanis, 2012), we show the vicious cycle generated by this race to the bottom. The main caveat of this wisdom is to treat wages as a cost item. However, wages have a dual role affecting not just costs but also demand. We work with a post-Keynesian/post-Kaleckian model, which allows this dual role. We estimate the effect of a change in income distribution on aggregate demand (i.e. on consumption, investment, and net exports) in the G20 countries. Consumption is a function of wage and profit income, and is expected to decrease when the wage share decreases. Investment is estimated as a function of the profit share as well as demand, and a higher profitability is expected to stimulate investment for a given level of aggregate demand. Finally, exports and imports are estimated as functions of relative prices, which in turn are functions of nominal unit labour costs, closely related to the wage share. The total effect of the decrease in the wage share on aggregate demand depends on the relative size of the reactions of consumption, investment and net exports. If the total effect is negative, the demand regime is called wage-led; otherwise the regime is profit-led. Mainstream economic policy assumes that economies are always profit-led, whereas in the post-Keynesian models the relationship between the wage share and demand is an empirical matter, and depends on the structural characteristics of the economy. Next, we develop a global model to calculate the effects of a simultaneous decline in wage share. We calculate the responses of each country to changes in domestic income distribution and to trade partners’ wage share. The results are summarized in Table 1. At the national level, the US, Japan, the UK, the Euro area, Germany, France, Italy, Turkey and Korea are wage-led. 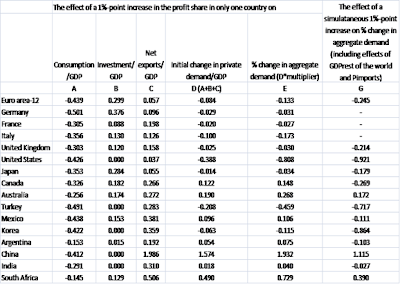 Canada and Australia are the only developed countries that are profit-led; in these small open economies, distribution has a large effect on net exports (see Column D and E). Argentina, Mexico, China, India, and South Africa are also profit-led. At the global level, the race to the bottom in the wage share, i.e. simultaneous increase in the profit share by 1%-point in the major developed and developing countries, leads to a 0.36% decline in global GDP. The Euro area, the UK, and Japan contract by 0.18-0.25% and the US contracts by 0.92% as a result of a simultaneous decline in the wage share (see Column G in Table 1). Some profit-led countries, specifically Canada, India, Argentina and Mexico, also contract as a result of this race to the bottom. The expansionary effects of a pro-capital redistribution of income in these countries are reversed when relative competitiveness effects are reduced as all countries implement a similar low wage competition strategy; this consequently leads to a fall in the GDP of the rest of the world. The wage-led economies contract more strongly in the case of a race to the bottom. Australia, South Africa and China are the only three countries that can continue to grow despite a simultaneous decline in the wage share. First, at the national level in a wage-led economy, a higher profit share leads to lower demand and growth; thus even though a higher profit share at the firm level seems to be beneficial to individual capitalists, at the macroeconomic level a generalised fall in the wage share generates a problem of realisation of profits due to deficient demand. Second, even if increasing profit share seems to be promoting growth at the national level in the profit-led countries, at the global level a simultaneous fall in the wage share leads to global demand deficiency and lower growth. At the national level, if a country is wage-led, pro-capital redistribution of income is detrimental to growth. There is room for policies to decrease income inequality without hurting the growth potential of the economies. For the large wage-led economic areas with a high intra-regional trade and low extra-regional trade, like the Euro area, macroeconomic and wage policy coordination can improve growth and employment. The wage moderation policy of the Euro area is not conducive to growth. Debt-led consumption, enabled by financial deregulation and housing bubbles seemed to offer a short-term solution to aggregate demand deficiency caused by falling wage share in countries like the US, UK, Spain or Ireland until the crisis. The current account deficits and debt in these countries were matched by an export-led model and current account surpluses of countries like Germany, or Japan, where exports had to compensate for the decline in domestic demand due to the fall in labour’s share. However this model also proved to be unsustainable as it could only co-exist with imbalances in the other European countries – an issue, which is now in the epicentre of the Euro-crisis. A global wage-led recovery as a way out of the global recession is economically feasible. Growth and an improvement in equality are consistent. This is true for wage-led and profit-led countries. We present a scenario, where all countries can grow along with an improvement in the wage share, and the global GDP would increase by 3.05% (Onaran and Galanis, 2012). The austerity policies with further detrimental effects on the wage shares since 2010 will only bring further stagnation. Growth in China and a few developing countries alone cannot be the locomotive of global growth. A global wage-led recovery can also create space for domestic demand-led and egalitarian growth strategies rather than export orientation based on low wages in the developing countries. Second, even if some important developing countries are profit-led, like China and South Africa, south-south cooperation can create a large economic area, where destructive wage competition policies are avoided. Rebalancing growth via increasing domestic demand in the major developing countries, in particular China would also be helpful in addressing global imbalances. However, this rebalancing can only take place in an international environment where the developed countries not only leave space for developmentalist policies, support technology transfer, but also create an expansionary global environment. Given the profit-led structures in some developing countries, the solution requires a step forward by some large developed economies in terms of radically reversing the pro-capital distribution policies. Source: Onaran and Galanis, 2012. 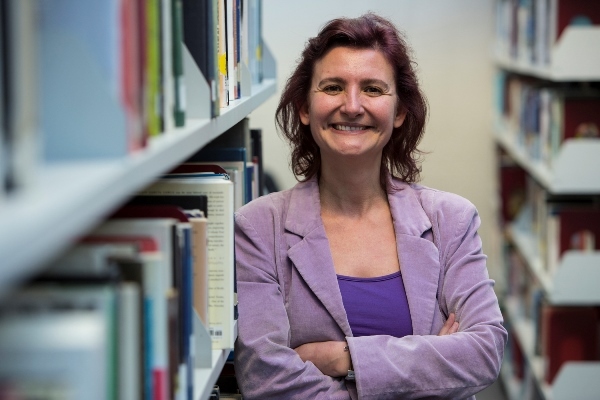 Özlem Onaran is a Professor at the University of Greenwich. She is a member of the Coordinating Committee of the Research Network on Macroeconomics and Macroeconomic Policies, a research associate at the Political Economy Research Institute of the University of Massachusetts, Amherst, and a fellow of the Global Labour University. Two comments regarding the following passage: "At the national level, the US, Japan, the UK, the Euro area, Germany, France, Italy, Turkey and Korea are wage-led. Canada and Australia are the only developed countries that are profit-led; in these small open economies, distribution has a large effect on net exports (see Column D and E). Argentina, Mexico, China, India, and South Africa are also profit-led." One, I note the inclusion of Japan, Germany and the Euro area as wage-led economies because the export-focused policies of those economies do not reflect their wage-led characteristics. In the current crisis, Germany's export-focused policies have been transferred to the Euro area as a whole: "internal devaluations" in deficit countries without compensatory fiscal expansion in the surplus countries. Two, the author observes that "Canada and Australia are the only developed countries that are profit-led; in these small open economies, distribution has a large effect on net exports". Couldn't the causation run in the opposite direction; in other words, could the net exports of these countries lead to pro-capital distribution? Both Canada and Australia are big commodity exporters, something that I recall being associated with high profits. More generally, could heavy reliance on net exports plus the nature of those exports lead an economy to be profit-led?